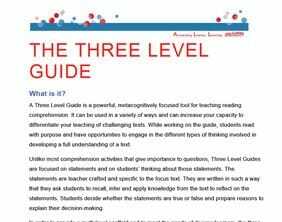 The Three-Level Guide is a tool that can be used to focus students' attention on reading and thinking about information in a text. You can create a Three-level Guide (made up of statements for readers to consider) to use with any text you wish. 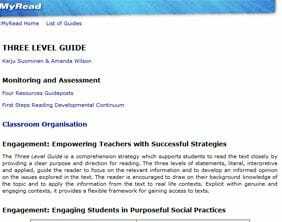 The purpose of the guide is to promote engagement at various levels of comprehension. The guide promotes thinking "on", "between" and "beyond" the lines. Using it flexibly in your classroom provides every reader with a point of access to thinking about a text, and a way of easily ramping up instruction using a single resource. The beauty of the Three-Level Guide is that it is both simple and complex at the same time!